Alison Wolf is Professor of Public Sector Management at King’s College London and the author of the ‘Wolf Report’ commissioned by Education minister Michael Gove in 2010 to ‘consider how we can improve vocational education for 14-19 year olds and thereby promote successful progression into the labour market and higher level education and training routes.’ Given that the recommendations of her report were fully implemented by the government, Alison Wolf can be described as the architect of our current 16-18 programmes of study and the associated funding system. We were therefore delighted when she agreed to give the Autumn NewVIc lecture earlier this month. Alison started by reminding us of the reality of social and economic change over the past 10 years; the increase in educational participation, the collapse of the youth labour market and the decline in mid-level skilled jobs. The same period saw a huge increase in vocational awards at Key Stage 4 and the attempt to impose equivalencies between very different qualifications, many of which provided very low returns to young people. We know for example that among the most highly valued qualifications in the labour market are GCSE English and Maths which are recognised and understood by employers. The funding methodology, performance tables and accountability system encouraged behaviours and programmes which were not always in the best interests of young people. A belief that early specialisation is undesirable; 14-16 year olds should follow a broad and largely common curriculum which does not pre-empt later choices. A belief that achieving at least a grade C in GCSE English and Maths whether pre- or post-16 should be given much greater priority. A belief that qualifications should be respected because of their value rather than by imposed equivalencies. A belief that students should follow coherent programmes rather than simply accumulate qualifications. The general education component of vocational qualifications should increase and a stronger emphasis on work experience post-16. These are some of the recommendations that led to the new definition of programmes of study with their single full time funding rate and minimum requirements which include the expectation that all young people who haven’t yet achieved at least a grade C in GCSE English and Maths should be continuing to work towards this. We don’t yet have the substantial qualifications we need to fulfil the requirements of programmes of study for young people who are not heading for university. ‘Resitting’ GCSE is quite a challenge for many and not everyone can achieve a grade C within a year. Finding genuine high quality work placements is not easy and the supply of apprenticeships for 16 and 17 year olds is not increasing. English post-16 routes are still too specialised by international standards. 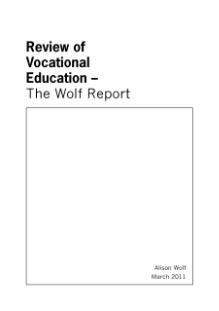 Vocational options face a difficult choice between becoming too ‘academic’ and losing workplace value or continuing to have a relatively low status. I bought Alison Wolf’s Does Education Matter when it came out in paperback over a decade ago and have found it to be worth returning to many times since. At a time when we were in the grip of binary thinking, as we still are in many respects, it made an unapologetic case for a good general education for all young people and rigorously analysed the inflated claims made for the economic benefits of ‘vocational’ pathways in all the various forms they have taken over the years. Together with the work of Ken Spours and Ann Hodgson it helped me to develop my own thinking and strengthened my support for a broad general education entitlement which would include practical and vocational elements; an inclusive National Bacc in fact. ‘The more overtly and the more directly politicians attempt to organize education for economic ends, the higher the likelihood of waste and disappointment…British politicians are not unusual in believing that that they can improve their country’s economic performance through government–led education policies. Alison Wolf has transformed the priorities for 16-18 education in England and set us on a different path and we now need to rise to the challenge of fleshing out the genuinely educational programmes of study which can give young people the best possible start in life as learners, workers and citizens. She has also consistently challenged the orthodoxies of the ‘knowledge economy’, ‘skills shortages’ and doubted the ability of education to solve our economic problems. We need to continue to question the conventional wisdom about the relationship between education, skills and employment including any model which promotes narrow instrumentalism for the least successful students. We need to keep our eye on the goal of providing the good all-round education all young people need to flourish. This entry was posted in Education policy and tagged Alison Wolf, Ann Hodgson, curriculum, Education, English, Ken Spours, liberal education, Maths, National baccalaureate, Post-16 funding, Tech Bacc, vocational education. Bookmark the permalink.